It's State of Origin 1st night in Brisbane tonight. The city is decked out in maroon today, even the public transport buses got into the spirit. Suncorp Stadium and the suburb of Paddington had a carnival atmosphere when I drove past on my home from work this evening. ﻿﻿So what is it all about? State of Origin﻿ is a series of three rugby league games. 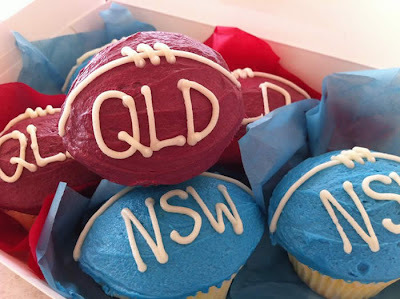 The teams represent the states of Queensland and New South Wales and the players play for the state where they started their senior rugby career - hence the name State of Origin. The Queensland team are usually referred to as the Maroons and the New South Wales team are known as the Blues. Now I know accents can make words sounds different, but I don't quite 'get' the way Australians pronounce Maroons! They say "Maroans".....it's Marooooons!! Anyhow, whatever the way you pronounce the names of the teams there is tremendous rivalry between these two states and State of Origin is fiercely contested. Tickets are sold out, parties are held, even some of the local cinemas are showing the game, supermarkets remind everyone of all the 'essential' foods that you need for the evening and pizza take away places make a fortune. Neil is there somewhere amongst the 52,000 fans cheering on his adopted state. I have the TV on and keep scouring the crowd shots, but everyone looks the same in their maroon tops with a few blue ones dotted around. Beth, you are so patriotic! My hubby is watching it as I type this (he's now yelling at the TV...what is it with that?) with a big mug of PG tips tea and a packet of Arnott's choc monty's. I have just finished watching that Bethenny show on cable and have been blogging...I will do anything to avoid watching it! PS I also agree with you on the pronunciation of maroons...Men!!! This post made me smile! Thanks for sharing at Beach Cottage Good Life Wednesdays. Those cupcakes looks so cute and yummy! Well I'm glad you explained about it after saying it cos I would never have known - I bet my husband wouldve though! Hope your hubby enjoys himself! Thanks for your comment! Poodles are so cute arent they? Can just imagine your's strutting her stuff afterwards - they are such poised, elegant little dogs one minute, and thne race around like hoodlums the next! p.s. yes I brought all my 'crap' with me (that's what hubby calls it), including 3 dinner sets...we knew we could be renting for years and I was determined to have my stuff all around me...and yes I have of course been adding to my collection....England is full of a lot a great old crap!